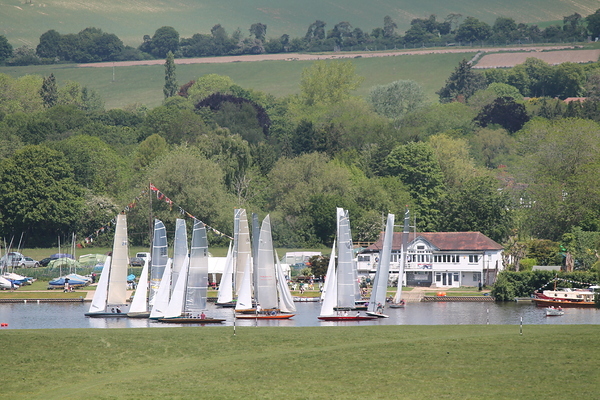 We have class racing for the Merlin Rocket, International OK, Wayfarer and Thames A Rater classes, plus a Handicap Class of mainly Solos, RS Aero and National 12 dinghies. For younger sailors, the Topper and RS Feva classes are used. The Merlin Rocket is the ultimate hiking dinghy for two people. It has been refined over 70 years of development and is now an extremely modern class providing excellent racing throughout the UK. At 14ft by 7ft 2ins, the modern boats are very wide compared to other classes, giving maximum righting moment when hiking, without needing a trapeze. The earlier hull shapes were much narrower, when river sailing was a priority and many of these narrower boats are sailed at UTSC. Mainsail shapes are very distinctive, with a long top batten giving extra area high up. The rules allow for different sail plans but most new boats since the early 1990s have opted for what has become more or less a class 'standard'. A large symmetric spinnaker gives exciting reaches and allows running too - an important consideration at Upper Thames where asymmetrics find it difficult to operate. Merlins perform extremely well on the river at UTSC with many of the club competitions regularly won by Merlin crews. 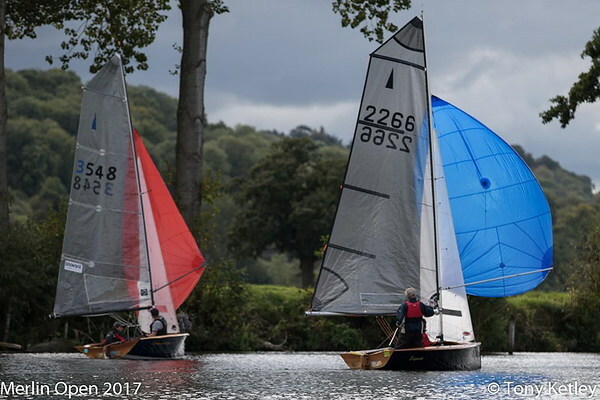 Each year the club hosts a Merlin Open weekend with vintage boats racing on the Saturday and more modern designs taking part on the Sunday. UTSC regularly hosts the national Silver Tiller Opens where many of the UK's leading Merlin crews will come to race at the club. During Bourne End Week the Merlin fleet competes over three days for the National River Championships and this will see over 20 Merlins on the starts. 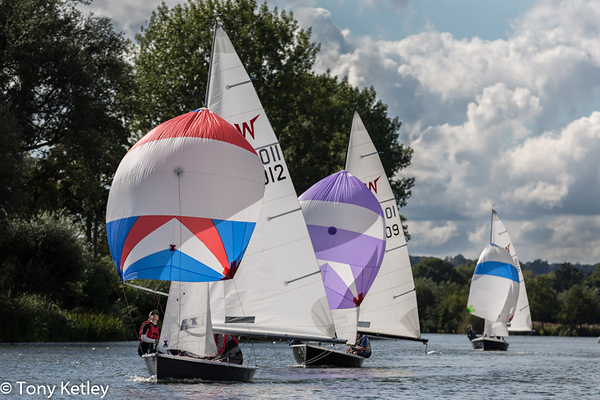 In 2016 Upper Thames hosted the Merlin Rocket 70th anniversary celebration weekend (we also hosted the 50th and 60th), which saw many of the fleet's past champions taking part in a weekend of racing and socialising. Upper Thames has a large and active Merlin Rocket Fleet with a with range of abilities and many of the Merlins are sailed by ever changing combinations of family members. The Thames A Rater is one of the oldest boat classes still racing and is unique to the River Thames. The rating rule was adopted nationally in 1887 as the design for racing yachts of all sizes both inland and at sea. A boat's rating was calculated by multiplying the waterline length by the sail area and dividing by 6,000. This simple rule gave considerable scope to designers by way of rig, sail area, length and construction. To be a Thames A Rater a boat must have a rating of between .75 and 1 on this measurement and be sailed by a crew of three, but apart from that almost anything goes. Photographs of the early boats can be seen in the clubhouse. They were lugsail rigged; later this was replaced by gunter and in the 1920s by Bermudan. Much larger boats of up to 40 rating were built for sailing on the sea. There are now twelve wooden boats of which eleven were built before WW1, ten GRP and one carbon-fibre. The oldest is Ulva built in 1898. Sail numbers below 14 are random and do not indicate built sequence whereas later ones do. No two boats, even from the same mould, are identical but typically the overall length is 26' with a 16' waterline. Wooden boats carry 385 sqft of sail and the newer ones 350 sqft which reduces the need for handicapping. Masts, usually carbon, are about 43' tall and the mainsail is fully battened. The result is a boat which is stunning to look at, huge fun to sail and very quick. There is nothing faster or more enjoyable on the river. 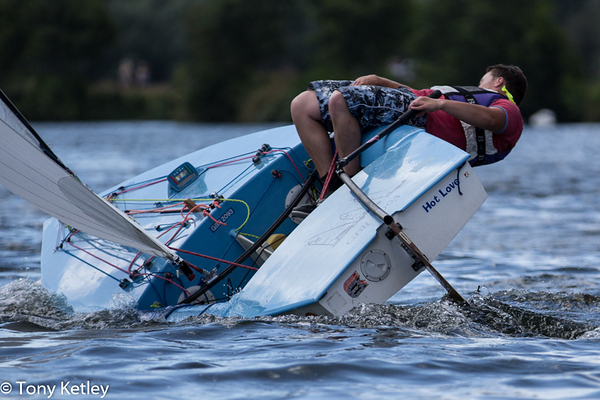 Bourne End Week regatta is the main event of the year. Here the principal race is for the Queen's Cup presented by Queen Victoria in 1893 and the only Royal Cup given to an inland sailing club. The Thames Champion Cup originated in 1887 to celebrate Queen Victoria's jubilee, and is run over eight races, some of which are also races for other cups. The usual turnout is between twelve and sixteen boats. 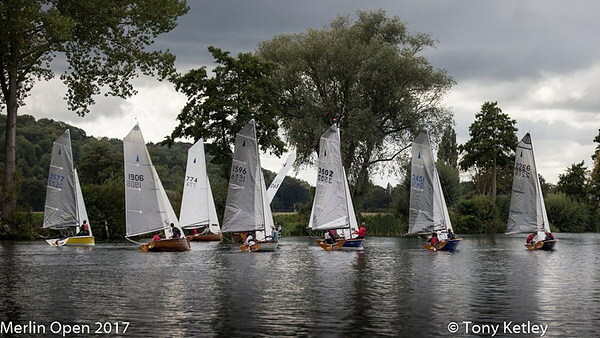 Another popular event is the Three Rivers Race run on the Broads by Horning SC in which up to six boats participate. Most of the boats are based at Thames SC at Surbiton but seven belong to UTSC members. These are Kingfisher (1) built in 1909; Surf (3) built in 1908; Vanessa (6) built in 1902; Dainty Too (11) built in 1922; Spindrift (14) built 1981; Tara (23) built 2002; Adventurer (24) built 2012. They race regularly on Wednesdays and Sundays. With three needed in the crew there are often vacancies so please get in touch with one of the owners if you'd like a sail.